NOW IN 90 SIZE WHICH IS NOW DOUBLE IN STRENGTH BUT SAME PRICE AS THE 180 SIZE WHICH IS NO LONGER AVAILABLE SO ONLY NEED TO TAKE I PER DAY. 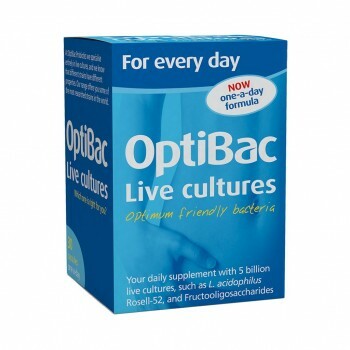 OptiBac Probiotics For daily wellbeing is a unique and balanced formulation of 6 different probiotic strains combined with prebiotics (i.e. food for the probiotics to flourish) to provide daily maintenance for our digestive health and immune systems. For anyone unable to swallow capsules, the capsule can be opened and contents mixed with a cold meal or beverage.OptiBac will not cause dependency, and can safely be taken on a long-term basis. Live cultures are not recommended for those with serious medical conditions eg. those who are severely immunosuppressed, have pancreatitis, are in the ICU, have melaena, have a central venous catheter, infants with short bowel syndrome, or to patients with open wounds following major surgery; unless under a doctor's care. 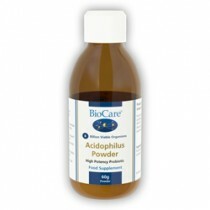 Furthermore, pregnant or breastfeeding women should consult their doctor before taking Saccharomyces boulardii, 'For travelling abroad', or natural plant extracts as in 'For daily immunity'.